A 53-year-old otherwise fit Caucasian woman underwent a routine colonoscopy for polyp surveillance. Her past medical history revealed gastro-oesophageal reflux, dyslipidemia, hip bursitis, and laparoscopic cholecystectomy two years ago for cholelithiasis. She was a non-smoker, rarely consumed alcohol, and had no drug allergies. Her regular medications were esomeprazole and atorvastatin which she had commenced 3 years ago. The procedure itself was not technically difficult and deep abdominal palpation was not performed during the colonoscopy. A scar was seen at the site of a previous polypectomy in the transverse colon with no residual polyp. A 2 mm ascending colon polyp was removed with a cold snare and no electrocautery was used throughout the procedure. She was premedicated with midazolam, propofol and alfentanil. The patient developed an acute onset of abdominal pain 2 hours post procedure associated with generalised cramping. She was observed in the endoscopy unit for a few hours before being discharged. The pain persisted and she presented to the Emergency Department of our institution the next day after developing nausea and vomiting. She had minimal flatus and could not pass any bowel motions. On physical examination all her vital signs were normal and her abdomen was tender in the epigastrium without any signs of peritonitis. Initial laboratory investigations revealed a white cell count of 13.65 × 109/L (normal 4-11 × 109/L), C reactive protein of 67 mg/L (normal &lt;5 mg/L), and a lipase of 809 U/L (normal 20-210 U/L). Haemoglobin, liver function tests, calcium and lipid profile were all normal. Computed tomography scan of the abdomen showed inflammation in the body of the pancreas, with peripancreatic stranding, and a small amount of surrounding fluid consistent with acute pancreatitis.No CBD dilatation or stones were identified, nor any signs of pneumoperitoneum. The pancreas did not show any structural anatomical anomaly. Management consisted of complete bowel rest, intravenous fluids, antiemetics, analgesia and prophylactic antibiotics. She developed fevers and ileus during her prolonged admission, and her CRP rose up to 270 quantifying a severity score of “severe pancreatitis” according to recent studies. 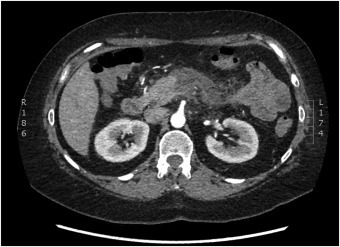 She subsequently had a repeat CT abdomen which did not show any signs of pancreatic necrosis, pseudocyst, pseudoaneurysm, or fluid collection. As she showed clinical and biochemical improvement over the next week, her diet was escalated back to normal and she was discharged day 11 post presentation in stable condition.